This post took much too long to put together because I have been intensely involved in a few Words With Friends games. Major throwback to Yahoo Literati games back in the day. And thus, major productivity fail. 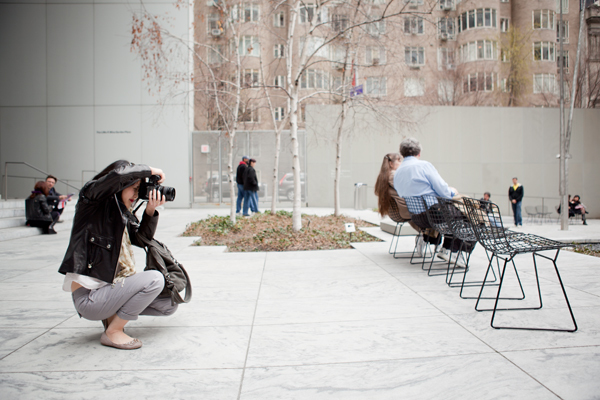 Here are some snapshots from a recent visit to the MoMA. Jimmy and I were really there to check out the Standard Deviations: Types and Families in Contemporary Design exhibit, but we also came across a neat exhibit on kitchen design. Also pictured is the initial sketch of the ubiquitous I <3 NY logo! These were all shot on Portra 400. I'm dying to get my hands on more slide film but alas, Passover means the camera stores won't be open for another week or so. I loved this hallway but probably could have done much better with a wide lens. The light there was perfect. P.S. Karleen, I think you were impressed that I wore those red heels all day but you can see here I cheated a little bit. ;) Sometimes you just gotta choose function over fashion. ah those I <3 NY signs are so cool. i like all the candids of the folks there. Great pictures! I've been dying to go to the MoMA in Fort Worth / Dallas! These exhibits look so interesting! I picked the MET over MoMA the last time I was in NYC. This summer, I'm heading over to MoMA. I would love to visit this museum!